Amazing property situated in quiet and panoramic location in the surrounding of the charming medieval town of San Gimignano. 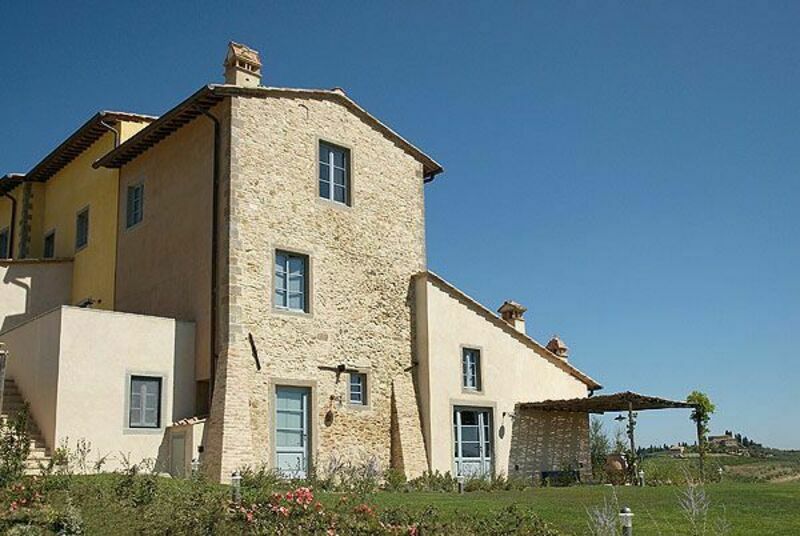 This property, offering enchanting views over the Tuscan landscape, has been recently and carefully restored preserving its original architectural features and its ancient charm. The interiors are tastefully furnished and decorated with beautiful pieces, the outside areas, affording extensive views over San Gimignano towers, are spacious and very well-kept and offer the possibility of enjoying the beauty and the tranquility of the surrounding landscape. The property comprises a main building and some annexes all of which have been turned into 6 comfortable and beautiful apartments (one of which is occupied by the owners) and 5 bedrooms. The owners of this property also run a family farming estate producing an excellent wine available for clients to tasted and purchased. Distances: San Gimignano with all kinds of shops only 1,2 km away, Siena 35 km, Florence 45 km away, Volterra 30 km, Pisa (airport) approx. 80 km away. At guests’ disposal: large furnished outdoor areas, beautiful swimming-pool (7 x 14 m – min. depth 1 m – max. depth 2 m – open from 01/05 to 30/09) with solarium set in panoramic location. Parking within the grounds. Extra services to be paid on site: Maid service available by arrangement (€ 15,- / per hour). On request it is possible to arrange daily breakfast (served on a beautiful panoramic terrace during summer and in a lovely breakfast room in winter). Wine tasting and guided tours of the farming estate can be organized on request. Common washing machine available for the apartments 2, 3 and 5 at € 5,- per wash. Baby bed available at € 30,- / per week. Small independent house with personal garden and covered furnished veranda. Ground floor: living-room (satellite TV) with dining area and kitchen corner (freezer, microwaves, toaster, orange squeezer), double bedroom with access onto the outside, bathroom with shower. 1st floor (entrance through a winding staircase): loft with little living room, bedroom with single bed and bathroom with shower.